Attending the luncheon are, from left, Oliver E. Williamson (Economics), Venkatraman Ramakrishnan (Chemistry), Elinor Ostrom (Economics), Jack Szostak (Medicine), Thomas Steitz (Chemistry), Ambassador Matthew Barzun, George Smith (Physics), Carol Greider (Medicine) and Elizabeth Blackburn (Medicine). 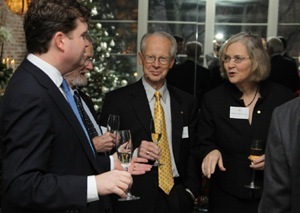 Ambassador Matthew Barzun and his wife hosted a luncheon on Dec. 9 to honor the 2009 American Nobel laureates, including UCSF’s Elizabeth Blackburn, PhD, at the U.S. Embassy in Stockholm, Sweden. Blackburn joined the other Nobel laureates for an intimate luncheon with Ambassador Barzun at the Embassy, which was decorated for the holidays. Barzun was sworn in on Aug. 12, 2009 as Ambassador of the United States to the Kingdom of Sweden. Prior to becoming an ambassador, Barzun had a successful career in business. He was the president at BrickPath LLC, where he advised and invested in Internet media companies. Ambassador Barzun speaks with Nobel laureates, including Elizabeth Blackburn. All the photos from the Dec. 9 luncheon are posted on the Flickr site. Short videos are available on the Embassy’s YouTube channel.